Are you thinking about getting an automatic gate opener to make it easier to control your gate even if you are inside your vehicle in the middle of a storm? The Mighty Mule FM200 is a great contender which why we have compiled this Mighty Mule FM200 review to provide you with the information you can use when you are shopping for an automatic gate opener. Do you have a lightweight gate that has a length of up to 12’ and a weight of up to 300 lbs.? If so, the Mighty Mule FM200 can be used for your gate to make it easier for you to open and close it without getting in and out of your vehicle. It is manufactured by the Mighty Mule Company that has been producing gate openers in the US since 1987. The Mighty Mule FM200 control board is enclosed in a control box that prevents it from getting wet. The Mighty Mule FM200 manual can be difficult to understand when it comes to setting up the gate opener. This is another affordable and easy to install gate opener from Mighty Mule. It is great for lightweight gates but it also has Mighty Mule gate opener problems such as being a challenge to set up properly. If you don’t like welding on your gate opener, this gate opener will suit you because it is attached by using bolts. This is also a good gate opener for those who want to be able to attach additional accessories to their existing gate opener. This is a good gate opener if you already have an extra car battery you can use to power it, or if you are willing to purchase one for your gate opener. An alarm sets off when the gate is not closed for a specific amount of time then it closes automatically. This is very helpful when you unintentionally forgot to close your gate. It has a very attractive price tag that lets most people who have a lightweight gate afford to buy one for their property. Apart from the Mighty Mule FM200 home depot gate opener, there are also other notable dual gate openers that Mighty Mule produces. One of them is the Mighty Mule FM350, which you can select when the FM200 is not suitable for your bigger and heavier gate. If you have a dual gate, then you will find the Mighty Mule dual gate opener reviews very useful to select the best dual gate opener. Although you can still use two single gate openers for your gate, it is better to have one controller for both gate doors. The FM200 can be bought on Amazon, and comes with a 12-month warranty; it can even be shipped internationally. In as few as 2 days, some of those who ordered it from Amazon Prime have already received their order.For this to work, you need to buy a power source such as a car battery and a battery box for protection. You can also purchase a solar panel and connect it to the battery. This Mighty Mule FM200 Review has shown you both the good and bad sides of this automatic gate opener. 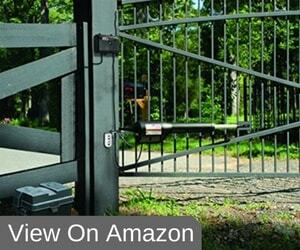 Although it is not a perfect product, we still recommend it especially to those who have a lightweight gate on their property. Installation may take time, but when properly installed and maintained, it can last for years to come.